Divan Group’s traditional flagship, with a heritage of more than fifty years, the Divan Istanbul, on Taksim Square, has been completely rebuilt to offer a heady mix of luxury design and Ottoman hospitality. 191 elegant rooms, 2 Presidential suites, luxury Puri Spa, spacious meeting rooms; 3 gourmet restaurants, Divan Bar, and Divan Patisserie with elegant sidewalk café. The Divan is an old Istanbul friend, an American-style hotel from the 1960s, that housed some of the city’s most cherished institutions including a wonderful pastry shop that served gooey cakes, and the Divan Pub – which was more a civilised place to grab a decent lunch rather than the Turkish equivalent of the Pig and Whistle. I can remember circa 1989, coming back from London with a fancy hair cut and my gruff Turkish editor-in-chief asking in an exasperated voice why didn’t I just go to the barber in the Divan. 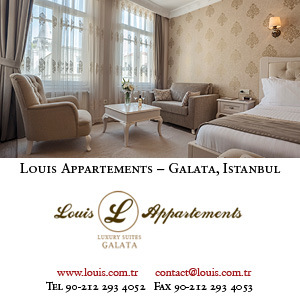 Above all it had location (location, location) – dab in the centre of the modern downtown, beside Taksim Square. The hotel needed a facelift; it has had a resurrection instead. It has been dismantled entirely and then re-assembled tip to toe. The results are pleasing and, in the case of the new dining room, with its lofty ceiling, spectacular. Always a showcase for Turkish cuisine, the Divan Restaurant is now a showcase of interior design. The new lobby has Ottoman feel with twin glass domes and solid beech furniture. Glass plays an important part with decorative medallions and sculpture-like chandeliers. The rooms, too, have lost entirely that package holiday feel and make clever use of space with a well thought out work area and a small sofa to relax. The Divan has now spawned a chain of other hotels in Turkey and even Northern Iraq and the Divan pastry shops and pubs have become national institutions. It belongs to the Koç Group, still Turkey’s most powerful commercial dynasty, and the family are still very much hands on in the design and running of the Taksim flagship.